Sustainable land use in forestry and agriculture is critical to prosperous rural economies, inclusive development and dealing with climate change. But more than that, it is t is an enormous investment and growth opportunity for the private sector. The importance of forests and agriculture to achieve the 2°C target of the Paris Agreement is undisputed. The consensus among scientists is that emissions reductions in agriculture, forestry, and other land use are “ extremely important ” to achieve global climate targets. From an economic point of view, forests and sustainable agriculture are often impressively cost-effective at-scale solutions to reduce emissions in the short term and getting to net-zero in the long term. What is more, new research by Chatham House suggests that agriculture and forestry may face an increasing risk of stranding assets – not only because of geo-physical impacts (droughts and desertification), but also because of regulatory and technology change. 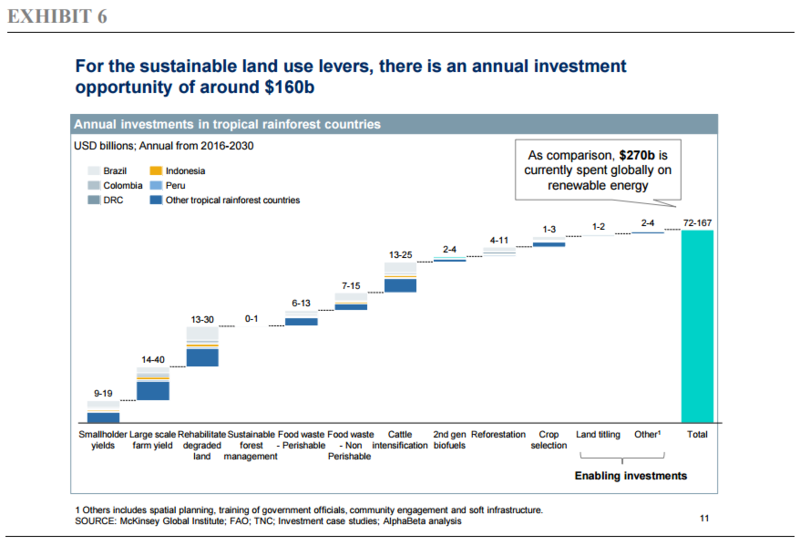 Meanwhile, new analysis we commissioned with the economics advisory company Alphabeta suggests that realizing sustainable land use represents an annual investment opportunity of up to USD 160bn p.a., with return rates of over 10% attached to the majority of those investments. To put this in context: USD 160bn per year is roughly 60% to what is currently going into renewable energy. Seen in the context of a persistently challenging global investment environment, this can become an attractive alternative investment window for value and impact investors alike. However, the amount of private sector investment which is currently directed towards key enablers of sustainable land use is quite limited. The key question therefore is: what are the ingredients for this emerging investment opportunity to materialize at scale? Shifting market preferences: Many companies, including those of the Consumer Goods Forum (a global industry network convening some 400 retailers, manufacturers and service-providers) have committed to time-bound goals for removing deforestation from their commodity supply chains . In only 24 months, the share of globally traded palm oil covered by zero-deforestation commitments increased from a low one digit figure to over 60%, potentially even higher. This unprecedented phenomenon has had multiple positive spill-over effects and plays a major role in shifting future growth and revenues towards sustainable, deforestation-free production of forest-risk commodities. Meanwhile, global demand for palm oil, soy, pulp and paper is growing and expected to continue to do so, not least because of the growing global middle class and increasing demand in key importing countries such as India and China. Together, the growing demand and the sustainable sourcing commitments favor sustainable production schemes, both at the smallholder and commercial scale. Clear policy signals and increased donor support: Many national, sub-national and regional governments in key forest countries are setting ambitious green growth plans with a particular focus on sustainable land use. The Brazilian state of Mato Grosso has announced the Produce, Conserve Include Strategy , the scale of which is enormous. It will require up to $10 billion over the next 15 years and will aim to mitigate 4Gt of CO2 emissions at an abatement cost of only $1.6 per ton. In West and Central Africa, many governments are now collaborating to develop shared principles for investment in sustainable palm oil development . Such principles will send a stronger signal to investors about the market and investment potential for the growing palm oil sector in the region. In Indonesia, the new Indonesia Estate Crop Fund will generate several hundred million dollars per year including for the support for the development of sustainable plantations and smallholder farmers. With the inclusion of REDD+  in the Paris Agreement, Norway, UK and Germany have committed additional funds of USD 5bn over the next five years to support implementation of the forest and land-use related climate goals in tropical forest countries. Multilateral and donor agencies are also providing various de-risking mechanisms, such as a new de-risking facility announced by Norway. Development of a pipe line of investable projects: Today, most of the commercial projects to produce and protect are being financed through the supply chain, with funds often coming from the balance sheet of producers. However, a growing number of asset managers are investing third party funds in scalable projects to increase deforestation-free production. The Luxembourg-based Althelia Climate Fund , for example, has invested EUR 11.5m for the Novo Campo Sustainable Cattle Ranching Programme in Mato Grosso. The pilot project aims to sustainably manage 34’000 cows by 2017. Initial results suggest four times more production on the same amount of land – without further deforestation. As a result, McDonald’s is now buying again beef from Brazil for the first time in 30 years . Another example is the Livelihoods Fund , supported by Danone, Mars Inc., Crédit Agricole and other major private sector companies to help rural farming communities improve incomes and livelihoods while restoring ecosystems. Currently, the Livelihoods Fund has mobilized capital in the amount of EUR 160m, and is open to new investors. Addressing Policy and Governance Risks: Clearly, there are a number of important risks associated with investments in sustainable land use that need to be addressed. For example, it is often unclear who actually owns the land and land conflict is a key barrier for banks to engage. Similarly, complicated supply chains scattered across millions of independent smallholder farmers, the informality of local markets, and foreign exchange risks, are all real concerns to investors. What is more, many commercial banks and investors have only little experience of sustainable agriculture – unlike other sectors such as renewable energy. It is critical that these political and governance risks be addressed effectively. The shifting market preferences, clear policy signals – both domestically and internationally – an emerging pipeline of scalable projects, governments are now encouraged to address these risks more effectively and create the policy conditions for successful investment in sustainable land use. The increasing alignment of supply chain actors, domestic policy priorities and international donor support opens up opportunity for getting to scale with sustainable land use. Instead of a project-by-project approach to realize sustainable land use, the move of entire jurisdictions towards deforestation-free production generates economies of scale for producers, buyers and investors alike. Realizing such transformative change at the level of an entire jurisdiction however requires strong public-private collaboration, both informally and formally, to truly materialize the emerging investment case for climate-positive land use in forestry and agriculture. The Tropical Forest Alliance 2020 provides a platform for public-private engagement where critical supply chain actors are coming together to remove deforestation from their operations and products to enable the necessary public-private partnerships. Such informal coalitions of the willing offer the needed vehicles to achieve systemic change and materialize the intrinsic growth opportunities that sustainable land use can bring about for producers, buyers, investors, bankers and governments alike. For example, Stern, Nicholas (2007), The Stern review on the economics of climate change, London: HMSO; McKinsey & Company (2009), Pathway to a Low Carbon Economy. Version 2 of the Global Greenhouse Gas Abatement Cost Curve; Climate Advisors (2016), Getting to Net Zero Climate Emissions and the Role of Forests.